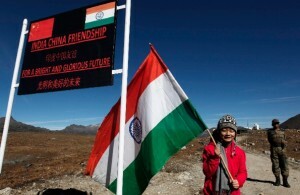 China and India are holding their third meeting on border affairs in New Delhi from Tuesday. The two-day talks will discuss maintaining “peace and tranquility on the border”, said Syed Akbaruddin, the official spokesperson of the Indian Ministry of External Affairs. Officials from the Defence, External Affairs, and Home Ministry will be present at the meeting. The spokesperson clarified that the scope of the meet does not include talks over the boundary issue or the new border defence cooperation agreement as these are being discussed by special representatives from the two neighbours. Indian media recently reported fresh incidents of incursions by the Chinese military across the border. Chinese news organisations have been critical of Indian media’s “sensational reporting” which they have said is “harmful to the China-India relationship”. During India’s Defence Minister A K Antony’s visit to China earlier this month the two nations announced a joint counter-terrorism exercise between their armies to be held in China later this year. Raju Santhanam, former editor of an Indian news network, says both sides are forced to underplay the significant talks because of what he termed “over-zealous media attention”. “People should understand that these are intricate issues and need prolonged engagement. Expecting magical outcomes is folly, especially in the context of tangled historical baggage,” Santhanam told The BRICS Post. China and India are targeting a bilateral trade target of $100 billion by 2015, a significant rise from the current $66 billion. India’s Prime Minister Manmohan Singh said earlier this year that China and India together accounted for 45 per cent of world growth in purchasing power parity in 2012.